Head of Rivne Regional State Administration Vitaliy Chuhunnikov has appealed to Interior Minister Arsen Avakov with the request to bring the National Guard to the northern areas of the region and stop illegal amber extraction, the press service of the Bloc of Petro Poroshenko has said. 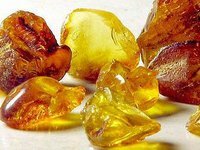 "Head of Rivne Regional State Administration Vitaliy Chuhunnikov has officially appealed to Interior Minister Arsen Avakov with the request to bring the additional units of the National Guard to the northern areas of Rivne region to stop illegal amber extraction and reduce criminality in the region," reads the report. The Bloc of Petro Poroshenko emphasizes that virtually at every meeting with the heads of law enforcement agencies Chuhunnikov notes the need for a more active fight of law enforcers against illegal diggers. Mobile raids are carried out in the northern parts of the region on the initiative of the regional administration head and the decision of the regional defense council. "Although these raids show some results, the recently released video footage and evidence suggests a lack of effectiveness," reads the report.